The New Jersey State Bar Foundation is soliciting nominations for its 2019 Medal of Honor awards beginning January 25th through March 1st. Awards are presented annually to lawyers and law-related professionals, as well as lay people, who have made significant contributions to the advancement or improvement of the justice system or the betterment of the legal profession in NJ. Nominees should be characterized by professional excellence and service to the profession and the community. The deadline for nominations is FRIDAY, MARCH 1, 2019. Awards will be presented at the New Jersey State Bar Foundation’s Gala Dinner on Monday, September 16, 2019 at THE PARK CHATEAU, East Brunswick, NJ. Please complete the Nomination Form and submit before March 1, 2019. 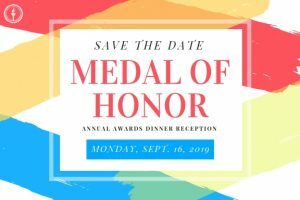 Don’t forget to Save the Date for the Medal of Honor dinner and join us at the Park Chateau on September 16, 2019.